You're doing a PowerPoint presentation and you suddenly have the need to show a flowchart or other simple vector graphics-based design. Or, you want to show a line graph using a math formula quickly and easily. Enter the free/donationware software Diagram Designer, which, through a simple drag-and-drop interface, allows you to create simple charts to your heart's content. Donationware tool Diagram Designer can create complex flowcharts, but it's very easy to use--and easy to work into your budget. Diagram Designer's obvious use is in flowcharting, creating a simple diagram-based chart that lets the presentation's audience know how a process works in a visual way. Without Diagram Designer, flowcharts would need to be created by hand or with technically difficult software like Adobe's Illustrator. With Diagram Designer, it just takes a few drag-and-drops. 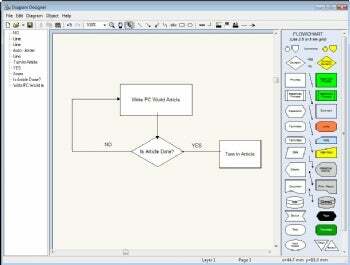 I found Diagram Designer very user-friendly. The nice thing about Diagram Designer's vector-based approach is that the elements of your flowchart can be any size and without losing image quality. The flowchart will be crystal-clear, especially if you save it in a lossless format such as .GIF or .PNG. Diagram Designer also includes an equation solver and advanced graphic calculator, for those giving math or science-based presentations. Someone showing a proof in math class might get a few extra points out of it if they use Diagram Designer; the results look very professional.